I grew up on the West coast of Ireland, in a town that peers over the Atlantic Ocean. On a clear day, you can sail north, and follow the waves all the way to Arranmore, the home of my sea-faring ancestors. With a population of just under 500 people, this beautiful, half-forgotten island is the place where my grandparents were born, grew up, and eventually fell in love. Arranmore makes mariners of its people. It made a Sea Captain of my grandfather; it followed him to the great lakes of America and home again. When my grandparents returned to Ireland, they settled on the mainland, but their island was never far from their minds. My brothers and I were raised on tales of shipwrecks and adventures, brave sailors and treacherous life-boat rescues. We wore our grandfather’s captain’s hat low over our eyes, played with the ship’s wheel mounted in his kitchen, impatiently tapping the barometer to make the storm come out. Even when we were on land, it felt like we were at sea – sailors on an enchanted ship, with our very own captain steering a course for Arranmore. As the years passed, this wild and remote place seemed to drift further and further away. My brothers and I grew up, and my grandfather, after a time, began to forget. First, his stories. Sometimes, himself. With his dementia, came the beginning of a difficult long goodbye. All of it – the sea and the island and my childhood and my grandfather – began to slip through my fingers. And then, one day, in the Spring of 2017, an unexpected invitation arrived from Arranmore. A cousin of mine had written to ask if I would like to visit the island for a week to teach creative writing in the local school. The sudden closeness of it, after so much time, was impossible to pass up. Within weeks, I was standing on the ferry to Arranmore, watching the island bubble up from my childhood. It was beautiful in its ruggedness, eight square miles scooped out of the waves and held in the ocean’s palm, like a precious coin. I peered over its jagged edges, with my back pressed to the lone lighthouse. I traced the soupy waters of Cowan’s lake, tiptoed down the weathered cliff-steps with the Atlantic wind howling in my ears, until the ocean churned restlessly at my feet. I visited the cottage where my grandmother was born, picked my way through the beaches where she played as a young girl, painting my shoes with sea-foam and sand. I had a drink in the pub where my grandfather grew up, clinked glasses with cousins who shared the same sea-blue eyes as him. Arranmore holds its people long after they’re gone. Centuries of stories are hemmed in by the Atlantic Ocean, kept safe and passed around like cups of tea on cold nights. In the evenings, I travelled from house to house, cousin to cousin, discovering them. My ancestors unfurled like ghosts from their tales, survivors of shipwrecks and invasions and famine, brave rescuers of half-drowned vessels, harbourers of soldiers washed up during both world wars, visitors and deserters, rebels and criminals and heroes. In the patchwork of the island, I found the stories from my childhood and in them, I discovered the missing pieces of my grandfather. It was the closest to real magic I have ever been. When I left Arranmore for the mainland a week later, I was determined preserve that unique sense enchantment and put it into a story. 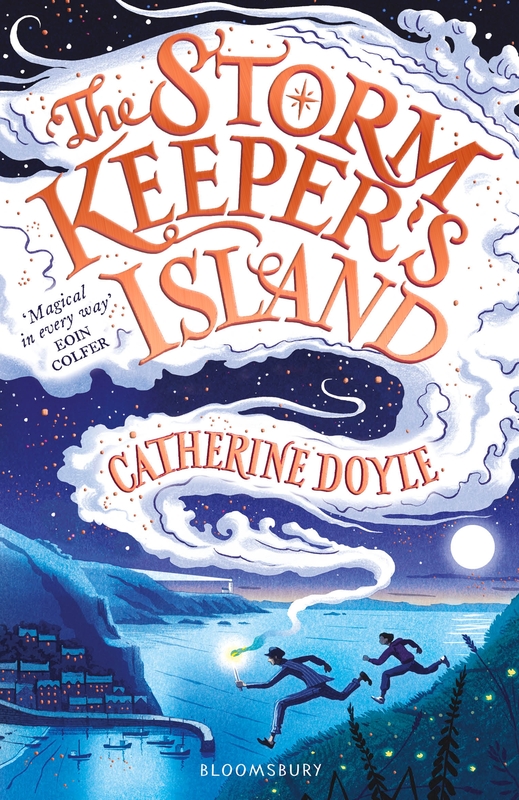 The Storm Keeper’s Island is the story of Fionn Boyle, a sea-fearing boy from a sea-faring family who returns to Arranmore one summer to find it has been waiting for him. It is on this enchanted island, where magic sings in the wind and rumbles in the earth, that Fionn relives the daring storm-swept adventures of his mariner ancestors and discovers the ancient destiny that has been waiting for him. But Fionn’s story is as much about the storms we must sometimes weather inside ourselves as it is about the ones that blow in from the Atlantic. I have spent the past couple of years trying to reconcile the grandfather I love with the version of him that is slowly fading away. Fionn faces the same challenge: the struggle to view his grandfather as a man who lives with Alzheimer’s disease but is not diminished by it. A man who is still the sum of all of his experiences, despite his inability to recall them. If Malachy Boyle cannot remember his own adventures, then Fionn must remember them for him. He learns, as I am learning, that for all the transiency of memories, love is not so easily erased by the winds of time. Arranmore Island marks the beginning of Fionn’s story. In many ways, it was also the beginning of my own. In July 2018, I visited my grandparents with a finished copy of the book, which I dedicated to them. Still living in Galway, and now in their 90s, they are no longer able to visit Arranmore, but they found it as they left it, within the pages of The Storm Keeper’s Island. Just with a little bit more magic. Catherine Doyle grew up beside the Atlantic Ocean in the west of Ireland. Her love of reading began with great Irish myths and legends, and fostered in her an ambition to one day write her own. She holds a first class BA in Psychology and a first class MA in Publishing from the National University of Ireland, Galway, and is the author of the YA Blood for Blood trilogy. The Storm Keeper’s Island is her debut middle-grade novel and was inspired by her real-life ancestral home of Arranmore Island, where her grandparents grew up, and the adventures of her many seafaring ancestors. After living in Dublin City for two years, Catherine is now based in Galway but spends a lot of her time in London and the US. I can hardly wait to read this book. Your post is beautiful. In my family we struggle with dementia, and I know this story will touch my heart. lovely story…. i’ve felt the magic too of ‘going back’ to a place you’ve never been perhaps, but relatives have lived there. Loved the idea of a place ‘waiting for you’. Stepping in the dirt they stepped in….. magical indeed. This book must be beautifully written–given this post. ON my TBR list now! This is a magical story I want to read. Thanks for sharing some of the magic of Arranmore in your post.! I think about writing my grandparents’ lives too — from County Donegal. Your story is beautiful, and I can’t wait to pick up your book. Congratulations on accomplishing such a precious thing, telling our families’ stories.